The global leading maker of mobile devices, Nokia has officially launched its new stylish, elegant mobile phones – Nokia X2-01, which combines 2.44-inch QVGA display with a VGA camera on the back and full QWERTY keyboard with an easy access to email accounts, IM communities and social networks, optimized for better messaging and social networking experience. In addition, the new Nokia X2-01 also come with music features, which allowing one click access to music, media player, FM radio and the Ovi Music service for unlimited access to a vast library of tunes. Unfortunately, X2-01 mobile phone only supports GPRS and EDGE connectivity and no WiFi are available. 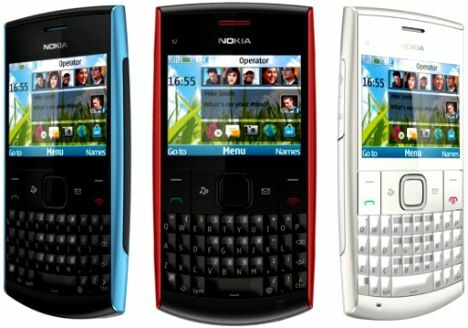 The new Nokia X2-01 mobile phone is available in 4 variants of elegant color – noble red, charcoal black, bright blue, and pearl white. Nokia X2-01 which measures 119.4 x 59.8 x 14.3 mm and weighs only 107.5g. It is expected to be available by end of the year for around $110.